Mix sour cream, cream of chicken soup, green onions, and 2 cups of cheddar cheese in a large bowl. Add the hash browns and mix together thoroughly. Pour mixture into a 9x13 baking dish that has been sprayed with cooking spray. 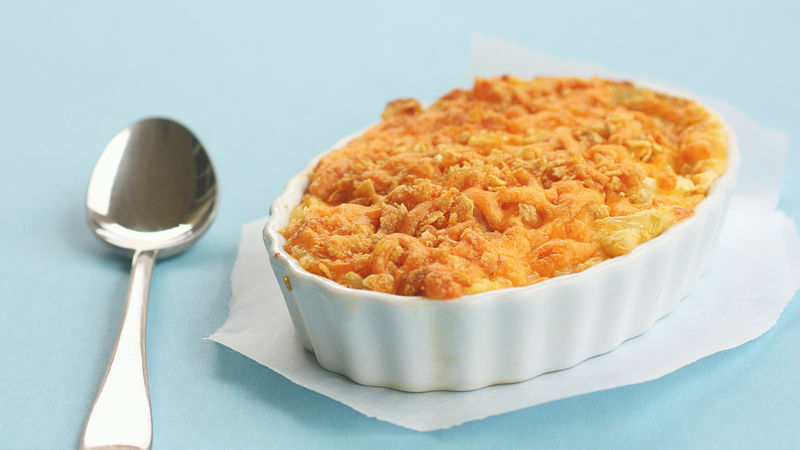 Mix the remaining 1/2 cup of cheese with 2 cups of corn flakes which have been lightly crushed. Reserve for later. Cover potatoes with tin foil and bake at 350°F for 35 minutes. Remove from oven and sprinkle top with corn flake/cheese mixture and bake an additional 15 minutes until potatoes are bubbling and top has browned. Whether it’s Christmas, Easter, or a summertime barbeque, you can be assured that these Gooey Potatoes will be on our dinner table. I feel like mashed potatoes and gravy are reserved for Thanksgiving so we serve these at basically every other holiday besides that. Some people call this dish potato casserole and some people call these funeral potatoes (or maybe just in my hometown?). Although I have been asked on more than one occasion to take these to a luncheon following a funeral, I always prefer to call them gooey potatoes. Gooey Potatoes is a much less morbid name and describes their bubbly, cheesy, and creamy nature. Here’s my perfectly portioned dish right out of the oven. Just sprinkle a cheddar cheese and cornflake mixture on top and pop it back in the oven to get the crust all crispy. The best part about these potatoes is that they can be prepared in less than five minutes. People are always amazed at how easy these are and still have that homemade and comforting taste. Christy’s Tip: You can save time by assembling this dish ahead of time. Store in the refrigerator then pop it into the oven and bake when you are ready.